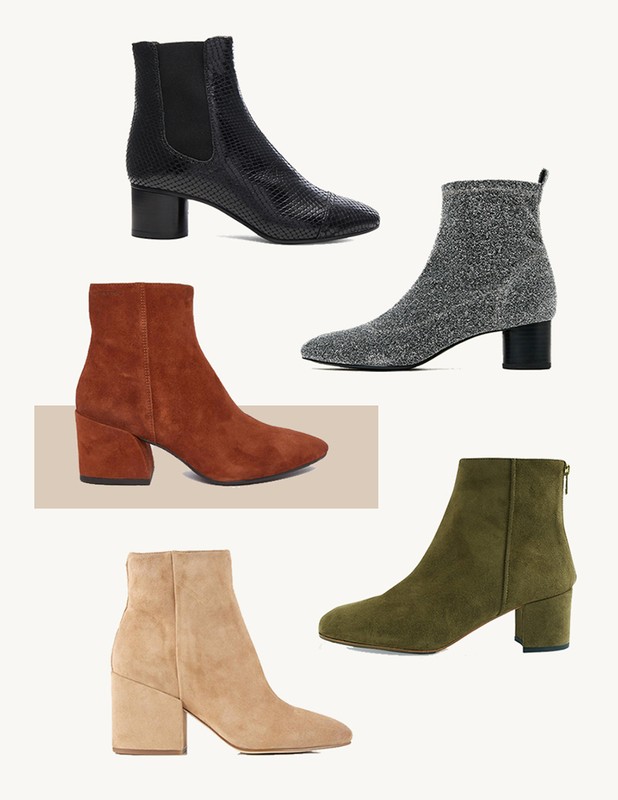 From the last post I shared a few things I liked and mentioned that I've been hunting for ankle boots, so I thought I'd share with you some that I've been looking for, all with a mid sized heel. When I was younger I remember my mom would explain that for her being comfortable was a priority when buying for herself, I was in contrast only concerned with aesthetics. These days though I really want both, meaning a simple style and solid color, preferably wrapped in the same material as the rest of the boot, with a realistic sized heel. I like ankle boots because they can do it all, wear them with jeans or trousers or a dress. Anything I wear needs to be easy and durable, I just don't have time for high maintenance pieces. If you are also looking for a few options, I hope this list will help you out as well. I love a good ankle boot. They are so stylish and customisable to an outfit. I own a pair and find them to add a bit of glam to a casual outfit! I own the sparkly ones from Zara and they're super comfy. I totally recommend those!